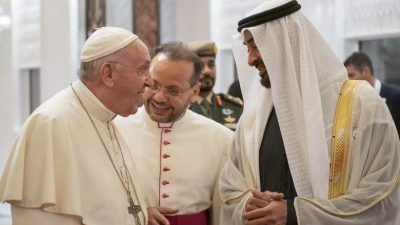 Pope Francis became the first Roman Pontiff to visit the Arabian Peninsula when he landed in Abu Dhabi on Sunday on a three-day visit to the United Arab Emirates. The Pope was welcomed onto Emirati soil by Crown Prince Sheikh Mohammed bin Zayed Al-Nahyan at 10pm local time. As the two men entered Abu Dhabi airport the Holy Father was greeted in Spanish, the Pope’s native tongue, by children in traditional Emirati dress who presented him with flowers. He then greeted the Grand Imam of al-Azhar, Ahmed el-Tayab, who is seen as a leading moderate among Sunni clerics and as a personal friend of His Holiness. Today, Monday, Pope Francis will meet with the Grand Imam and other members of the Muslim Council of Elders at a private meeting in the Sheikh Zayed Grand Mosque and he will also participate in an inter-religious dialogue at the Founder’s Memorial Visitors Centre this evening. The theme of the visit is “Make me a channel of your peace”, which reflects the urgent need in the region to pursue peaceful coexistence. Not only is the Middle East racked by inter-religious violence, with attacks on Christians by Muslim extremists on the increase, the region is also scarred by sectarian violence between the two branches of Islam, Sunni and Shia. At present, Saudi Arabia, which is a Wahabi Sunni state, and Iran, which is predominantly Shia, are engaged in a bitter proxy war in Yemen that has left at least 10,000 dead and left some 8.4 million people dangerously exposed to famine. It is understood that the UAE’s leadership is keen to act as a peace broker in this conflict and Pope Francis’s visit is likely to be part of these efforts. Yesterday, the Emirates’ ambassador to the United States, Yousef Al Otaiba, issued a statement explaining why the country invited Pope Francis to visit. In it he said: “Across the Middle East, we face the menace of extremism. Radical interpretations of Islam represent a tiny minority of those who practice the faith. But often the shrillest voices shout the loudest – whether it is on TV, on the internet or in a mosque. They twist and obscure the fact that Islam is a religion of peace. “These extreme voices seek to incite crazed followers to do their bidding. They give rise to zealots like who carry out hateful, violent deeds against religious and ethnic minorities. And fatefully, it is Muslims – Sunni and Shia – that suffer the heaviest price of all from the murderous fundamentalists. “Ignoring the threat or being complacent is too dangerous and will only feed the cycle of sectarian violence that has gripped the region for more than a generation. Removing the extremists by force is also not the answer as long as the poisoned ideology and the conditions that nurture it endure. So how do we break this cycle? “The Pope’s visit will highlight one approach close to the centre of the Muslim world. Today, the UAE is home to 200 different nationalities, more than 40 churches and approximately 700 Christian ministries. Sikh and Buddhist temples welcome multinational congregations. Tomorrow, Tuesday, the Pope will make a private visit to St Joseph’s Cathedral, one of only 40 Christian churches in the country, and then he will celebrate Mass in Zayed Sports City, where a congregation of 135,000 people is expected to join him. For a Muslim country, the United Arab Emirates has a large Christian minority. This is because the UAE has the world’s largest immigrant population: more than 9.5 million people live in the country, but only 11.48 per cent are native Emiratis. There are more than 8,000 Irish ex-pats living in the country. The UAE is seen as a more tolerant society than many of its neighbouring states. However, it is an absolute monarchy – the country’s rulers are chosen from the royal families that govern each of the seven individual emirates that form the country. The press and media are strictly controlled and the statute book recommends stoning and flogging as punishments for those found guilty of criminal offences.